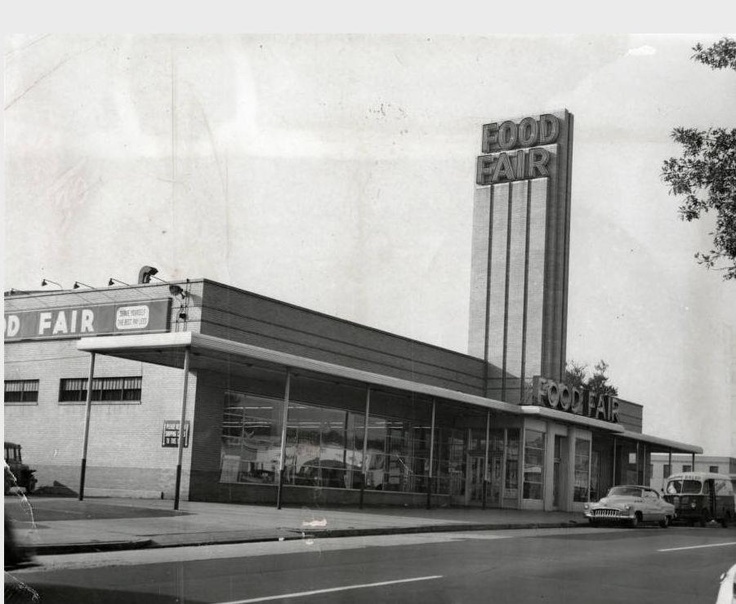 Out of nowhere, the long-gone grocery chain Food Fair has risen from the dead! OK, maybe that's a little dramatic. But this independent, four-store chain has grown quickly, starting with an actual Food Fair in Paterson, NJ, operated under the name Food Fair La Gran Marqueta. 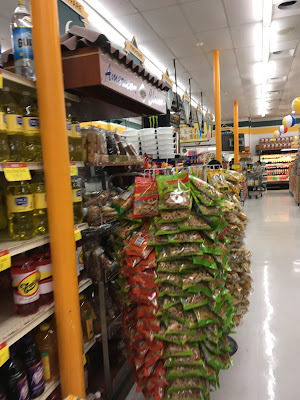 In 2015, a second location opened in Spring Valley, NY as a Food Fair Wholesale Fresh Market. Soon after, in 2016, a location in the Bronx, NY opened as a Food Fair Fresh Market in a former Fine Fare. Now most recently, in 2017, this Fine Fare in Newark has become the latest Food Fair Fresh Market. All of their stores are operating under Retail Grocers Group, which also runs Fine Fare stores. This store was previously the Fine Fare International Supermarket, which opened ca. 2008 in a closed C-Town, which does not seem to have been closed very long. On the far side of the building from the parking lot, which faces an intersection, there's another sign that hasn't been replaced yet. There are windows along the street side, but the entrance faces the parking lot. The inside is still 100% Fine Fare. I don't know if there are any plans for renovation here or if they'll just replace a few signs. You enter into a short hallway area with a closed storefront to the left; that's probably where the check cashing place used to be. Food Fair has produce stocked along the hallway on the front (street) side, then you turn 90-degrees to your left to enter the first aisle, which has produce, meat, and deli. You enter through the doors in the far right here. The closed storefront is behind the mayonnaise! This display is straight ahead as you enter. There is a (former?) security counter behind these shelves, which seems to no longer be in use as you'd think they'd want to have a straight-shot view to the entrance and exit, and these cases are quite high. Also the security camera screen to the far left above actually faces entering customers, not the desk. After you turn left, the produce department continues along both sides of the first aisle, with service meat/deli in the back corner. This store's produce was pretty good - I bought the best avocados I've had in a long time here! Produce looking back up towards the entrance/front wall of the store. Meat and deli in the back. The majority of the service department is for the butcher shop, but one case at the end has deli meats and cheeses. Notice how this store has almost fully switched to Food Fair sale signs, instead of using the old orange-striped Fine Fare sale signs. This was something I don't think I've ever seen before - rotisserie chicken in a bag! Notice that this store even has custom-printed Food Fair Fresh Market stickers with the address of this location. Surprisingly professional for a small operation. OK, I truly have no idea where this picture was taken or what it shows. Maybe looking from the back of the first aisle to the front of the first aisle? Or along the back wall? However, notice the single orange-striped Fine Fare sign on the Goya beans. Nothing much to see in the grocery aisles. Very nicely stocked, but a little cramped. One strange thing was that there are only aisle markers at the front of the store, leaving me to guess some of the time since I left my glasses at home! Meat along the back wall, looking back towards the first aisle. Frozen aisle towards the end of the store. It's kind of hard to tell here, but these cases look to have been updated pretty recently. They're older cases, but they have what looks to be brand-new LED lighting inside. Dairy in the last aisle with a few more Fine Fare sale signs, looking towards the back wall. One more look at dairy, this time looking towards the front of the store. The dairy department continues in a few cases along the front wall. 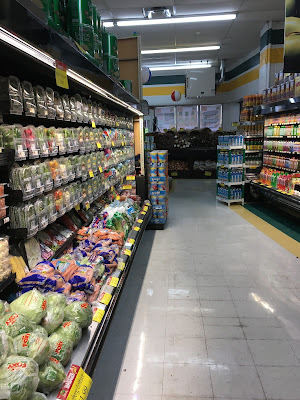 Looking along the front-end towards produce in the first aisle. The exit is actually along the front wall (to the left), rather than on the side wall towards the parking lot. You exit towards the sidewalk. Check out my Flickr photostream for more exterior pictures and the circular! Food Fair Fresh Market is a nice neighborhood store with a pretty good selection, although some of the prices are a little steep. There's not much competition in the neighborhood, which probably allows them to price things a little high. However, the store was very clean and well-stocked.